This is a luxury high-end condo for both the business and leisure traveler. Amenities include two bedrooms with king size beds with flat screen LCD HDTV and one bedroom with two twin beds with a 20 inch flat screen LCD HDTV with built in DVD player. 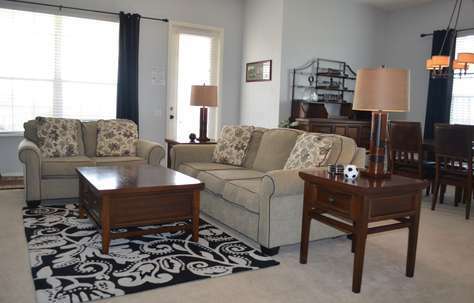 The living room features a 42 inch flat screen LCD HDTV with DVD player. The den includes a sleeper-sofa as well as a desk (for those that must work). 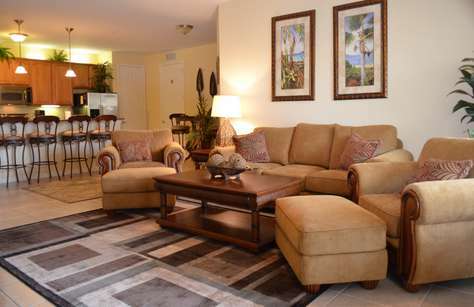 Wireless Internet access is available throughout the condo. The wonderful kitchen has top-of-the-line appliances, granite counter top with stools and a high top style table with stools. Full size washer and dryer. Vista Cay, a gated community, offers an elegant clubhouse, theater, fitness center, putting green, business center and meeting rooms, movie rental kiosk, a luxurious infinity pool, and children’s pool among its amenities. The resort style master suite features a king size bed, lavish linens, a flat screen T.V., a beautifully appointed master bathroom and a large walk in closet. The second and third bedrooms have a queen bed and two twin beds, making it ideal for families and convention travelers. Both rooms have flat screen TV’s. 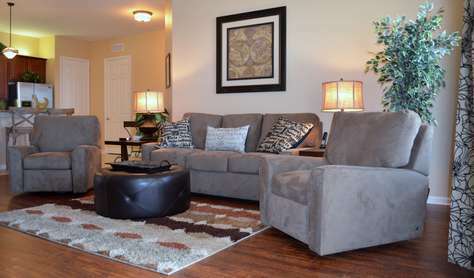 You will find beautiful hardwood floors throughout the unit along with luxurious carpet in the bedrooms. The gourmet kitchen is fully equipped with state of the art stainless steel appliances and utensils to prepare any meal. A formal dining room is ideal for anything from candlelight dinners to five course banquets. Internet, cable and local phone services are included. Children will find lots of entertaining toys, kid-friendly games and books. Whether you are in town to visit the area attractions, attend a conference at the Convention Center, or, as the majority of our guest do, a combination of both, this one of a kind property is the one for you. This professionally decorated home had been inspired by the All- American love of sports. It features elegant furnishings, modern home appliances, and the latest in home entertainment. Luxurious linens, bath and beach towels are provided for your comfort. High-speed wireless Internet, cable and local calls are included. This is a large corner South facing unit with lots of sunshine coming in. It is wonderfully spacious and bright. The great room features a living room with flat screen HDTV, blu-ray DVD player and a formal dining area. The fully equipped kitchen has stainless steel appliances, granite counter tops and a breakfast bar. The sitting room has wonderful leather furnishings, a Wii console and games, blu-ray DVD player, DVD library and board games. There is inviting outdoor furniture in the private balcony to sit and relax on lazy afternoons. The master bedroom features a king size bed, a sitting area, large flat screen TV, DVD player and large walk-in closet. The master bathroom has a Roman tub, shower and two vanities. The second bedroom also has a king size bed, and the third bedroom has a queen bed. They share a guest bathroom with shower/tub combination. Luxurious, well-appointed and magnificent are just a few words to describe this amazing condo. Professionally decorated in the Old Hollywood Style, this property is sure to be at the top of the best vacations places you have stayed at. The deluxe furnishings will have you feeling so at home the toughest part of the stay will be having to leave. This unit has been completely redone: new hardwood flooring, custom made bathrooms and great decoration. Luxury linens, fully equipped kitchen, flat-screen TVs, Blu-ray DVD players, cable, telephone and WiFi are just a few of the amenities you will enjoy. 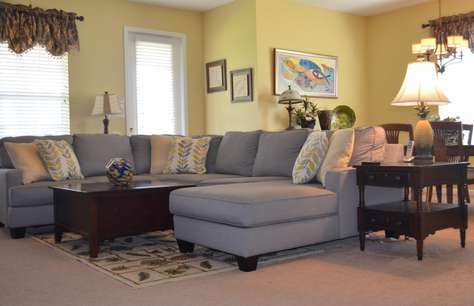 The cool pastel colors and comfortable furniture will have you falling in love with this home. The luxurious bedding, latest in home entertainment systems and state of the art appliances are here to make you feel pampered and you will wonder how you ever thought staying at hotels was a good idea! Next to the Orange County Convention Center, and close to the Area Attraction Parks, world class shopping and some of the best golf, staying at this home is sure to make this the best visit to Orlando. The spacious master bedroom features an elegant king size bed, sumptuous linens, a large flat screen HDTV, huge walk in closet and an en-suite bathroom. In the closet, a hotel safe has been installed to keep all valuables private and secure. The soothing second bedroom has a regal queen size bed, beautiful tropical linens, flat screen HDTV, and a closet. The beautiful third bedroom has two comfortable twin beds, a flat screen HDTV and closet. Which ever room you choose to sleep will have you waking up relaxed and serene every morning. A comfortable sofa bed in the game room can accommodate two people. 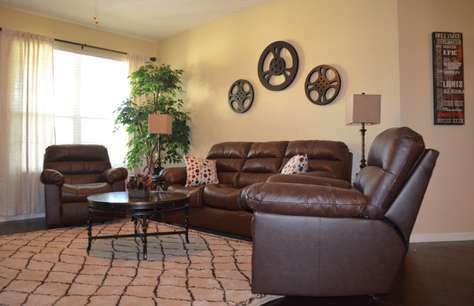 The living room has a super comfortable sectional couch, HDTV and blu-ray DVD player. It is perfect for lounging around on lazy days when you want to take time off from the attraction parks. The dining room, great for entertaining, has beautiful original artwork gracing its walls. The fully equipped kitchen will make any meal preparation a pleasant task with stainless steel appliances, granite counter tops and all the necessary items at your fingertips. A washer and dryer will help keep up with laundry without much effort. The home’s game room has a Wii console, Wii games and a large screen HGTV to keep children and adults having great time. High-speed Internet, local and national calling, and cable are included. Unwind sipping your morning coffee (or afternoon cocktail) sitting out on the comfortable chairs in the balcony to watch the world go by. 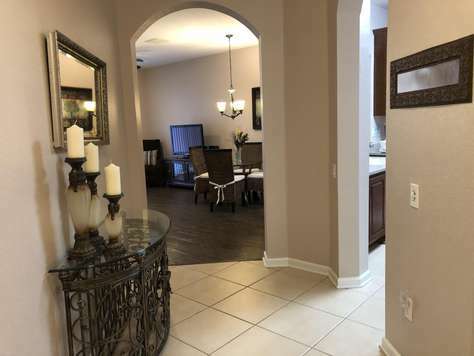 This incredible home will have you enjoying the easy going Florida lifestyle! The spacious master bedroom has an elegant king size bed, sumptuous linens and a large flat screen HDTV. Its best feature though: a fantastic view of the resort’s gorgeous infinity pool! There is a huge walk in closet, where a hotel safe has been installed to keep all valuables private and secure. The en-suite bathroom has a Roman tub, an enclosed bath and double sinks. The soothing second bedroom has a regal queen size bed, beautiful tropical linens, flat screen HDTV, and a closet. The beautiful third bedroom has two comfortable twin beds, a flat screen HDTV and closet. Which ever room you choose to sleep will have you waking up relaxed and serene every morning. A comfortable sofa bed in the game room can accommodate two people. 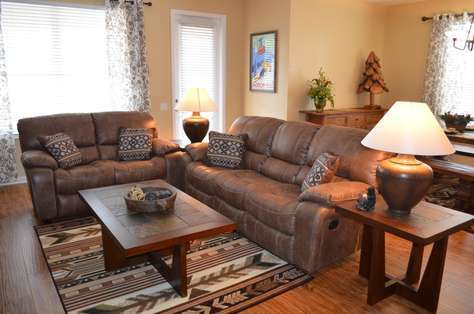 The living room has comfortable furnishings, HDTV and blu-ray DVD player. The elegant dining room is great for family meals or entertaining colleagues and clients. The fully equipped kitchen will make any meal preparation a pleasant task with stainless steel appliances, granite counter tops and all the necessary items at your fingertips. There is an oversized laundry room with full capacity washer and dryer. The home’s game room has a Wii console, Wii games and a large screen HGTV to keep children and adults having great time. High-speed Internet, local and national calling, and cable are included. Sit out on the balcony sipping your morning coffee (or afternoon cocktail) to enjoy the beautifully landscaped tropical gardens and the unbelievable view. The living room area features two ultra comfortable couches, a large flat screen T.V., a DVD/CD player, a Wii console and games. High speed wireless internet, cable and nationwide calling included. The large dining room table has seating for six. The fully equipped, modern kitchen will make meal preparation and entertaining a pleasure. It includes among its many conveniences: all mayor appliances, dishware and utensils, coffee maker, and toaster. A half bathroom is located on the second floor as well. A well appointed suite with two full-size beds, a flat screen T.V., a large closet, and an en-suite bathroom is located on the first floor. The master bedroom and a third bedroom are located in the third level. The master bedroom has a king-size bed, a flat screen T.V., DVD player, a large walk-in closet and a spacious bathroom with a Jack-and-Jill sink. The third bedroom has two full-size beds, a flat screen T.V. and an adjacent bathroom. You will find all the comforts of home at this property. Cable and free local calls are included. All linens, towels and beach towels are provided. All bathrooms are equipped with hairdryers. A full size washer and dryer, an iron and ironing board will make doing laundry easy and convenient. Whether in town for a convention, business or fun, this beautifully decorated condo will feel like home. Our open floor plan, fully equipped kitchen, state of the art appliances will make your stay comfortable and relaxing. The living room area has a large flat screen, blue ray DVD player and brand new Wii. The dining room is the perfect place to start the day with a hearty breakfast before heading over to explore the local attractions. The large master bedroom is tastefully decorated with a tropical feel. It has a large walk-in closet and an en-suite handicap friendly bathroom. The second bedroom and bathroom are located on the far side of the unit, giving extra privacy. All bedrooms have flat screen TVs and DVD players. 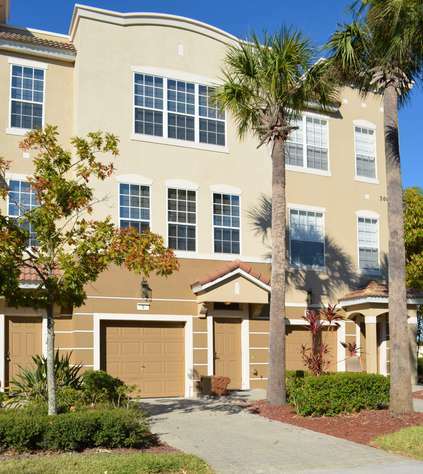 You will find a full capacity washer and dryer, along with all the items needed to make this your home while visiting the Orlando area. A 52 inch flat screen HDTV is located in the living room. A Wii, along with a variety of games, a blu-ray DVD player and movies are also available to enjoy. We offer a fully equipped gourmet kitchen with stainless steel appliances, towels and linen, a large capacity washer and dryer. We also offer free wireless internet access and local calling.